50 Per Package Four Seal Buyer's Guides. As Is / Spanish. 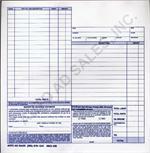 Sold 50 Sheets Per Package. Implied / Spanish Seals On all Four Sides. 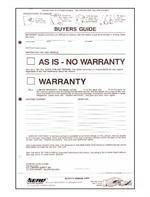 Buyer's Guides As Is Laser Forms. Front / Back Seals On All Four Sides. Packaged In 50 Per Package. Implied / English 4 Seal Buyer Guide. 1 Part Front/Back. Self Sealing, Seals On All 4 Sides, 2 Part Carbon. 100 Per Package. 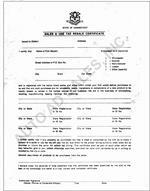 These Forms comply with All Regulated Rules Applied By the Federal Trade Commission. Implied Warranties. Please Allow 7 to 10 Days For Delivery. 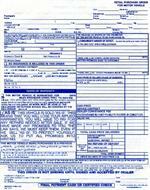 Federal Buyer's Guides Forms. 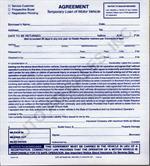 These forms comply With All Reuglated Rules Applied By The Federal Trade Commission. Self-Sealing, Seals On All 4 Sides, 2 Part Carbon. 100 Per Package. Please Allow 7 To 10 Days For Shipment. Cash Receipt Books. Wire Bound Book. Sold Individually. All The items You Need For Your Inspection In One Convenient Package. Package Includes one of each, Loan Pad, Garage Repair Orders, Consumer Right Sign, Labor Rate Sign, Supplemental Driver ID Cards. Connecticut Sales & Use Resale Certificate. 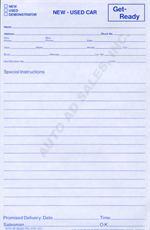 Sold In Pads Of 50 Single Sheets. Daily Work Flow Control. 21" x 14", 35 Lines. 100 Sheets. Padded in 50's On 80 lb Text. Daily Work Flow Control With Time Bank, Padded in 50's on 80 lb Text. 21" x 14", 35 Lines. 100 Sheets. Early Bird Service Envelopes-Blank Heading. Sold 100 Per Package. An Easy Way For Your Service Customers To Leave Their Cars For Service After Hours With A Description of Services Required. 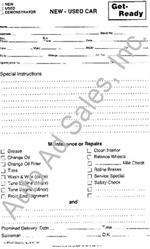 Garage Repair Orders 3 Part No Carbon Required, 100 Per Package. 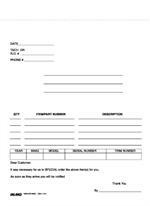 Garage Repair Orders- Non-Imprinted. 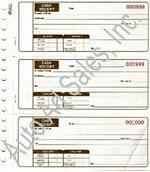 4 Part Form Consists of White, Yellow, Pink, with a Hard Tag Back. 150 Per Box. Loan Agreement Pads. Form # F-70. 50 2 Part NCR Sets Per Pad. Sold Individually. 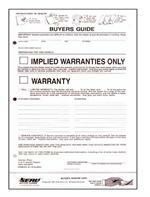 Revised 05/2017 Massachusetts Buyer's Guide With Lemon Law Included, 100 Per Package. Two Part Form Printed Both Sides. Adhesive Strips Top And Bottom. New & Used Car Get Ready Pads. 50, 2 part Carbon less Sets Per Pad. New & Used Car Get Ready Pads. 50, 3 part Carbon less Sets Per Pad.